Fresh tuna steak is so much more readily available these days. Low in fat, high in protein and versatile, here we accompany it with fresh pappardelle pasta. Dawn: Pappadelle? I don’t think I have used that before. Andrew: It is a wider and slightly thicker version of tagliatelle, basically. It also looks good in the ‘verde’ version, which is coloured with spinach. Dawn: One to make with my pasta machine then! Andrew: Chilli is a great option here for a winter evening. Dawn: Ginger is also an optional ingredient for those who like a Thai taste to their cooking, with a little lime juice, too. While the fish and vegetables cook, put a pan of salted water on to boil and cook pasta as per the packet instructions. Fry the tuna steak in a pan in a little olive oil. Turn after about 3 minutes and cook through. As you turn the tuna, add the onions, garlic and chilli to the same pan, around the tuna. After a further 3 minutes, when the tuna is cooked, gently break it up with a fork. Add the plum tomatoes, a splash of water (or if feeling a little decadent, a splash of white wine). Cover and steam for a minute, allowing the tomatoes to ‘pop’. Add the cooked pasta to the pan and stir gently so there is an even spread of tuna and tomatoes. Andrew: A super supper, wouldn’t you agree, Dawn? Dawn: I would, especially as there are so many potential variations on this too. For more great ideas keep following https://forfoodlovers.wordpress.com, our Twitter account @Love_Food_UK and don’t forget we can be found on Facebook and Mumsnet, too. 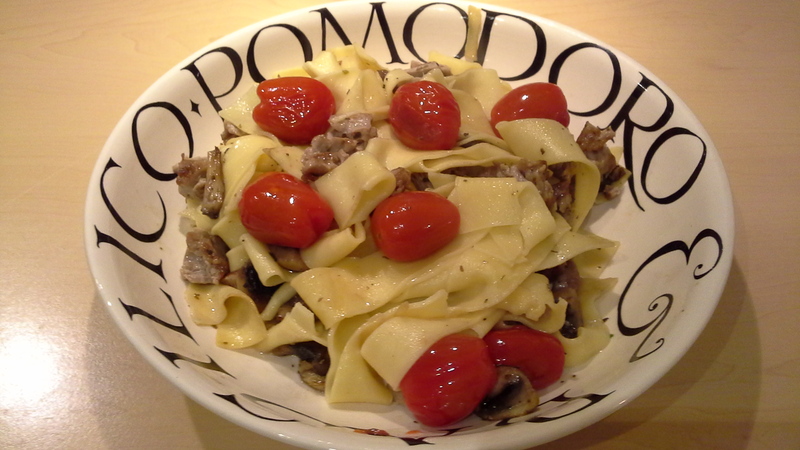 Posted on March 15, 2014 by Love Food UK	• This entry was posted in Dinner, Italian, Supper and tagged Pappardelle Pasta with Tuna and Tomatoes, Pasta, Tomato, Tuna. Bookmark the permalink.